I was born and raised in Arizona. My interests define me in many ways. My interest in religion drew me in to my vocation as a priest, which is enriched by my interest in magic. Both are supported in my interest in theater and mysteries. I also enjoy fantasy adventure films and books, although I rarely have enough time to indulge in those simple pleasures. I am also a big fan of Disneyland and Walt Disney World. I think it is my appreciation for their quality and the uplifting optimism that in some way has given me faith in humanity. The Imagineers have a great positive way of doing things, which says nothing is impossible. I like that a lot. I believe people should experience life and learn as much as they can about one another. God put us here together for a purpose and it is not to ignore one another. Like the quote from Mame, "Life is a banquet and most poor fools are starving to death." My personal philosophy of life is: Make dreams come true. I think it is important to have a dream to peruse in life. Once I envisioned my dream of touring with my magic as a means to evangelize, God took me to new wonderful places and brought even more wonderful people into my life. It was in high school that my training in theater arts really took off. As a freshman I performed in two large musicals, and became a member of the National Thespian Society. My high school provided excellent facilities for theater arts and gave me a good training in the Back stage and technical sides of theater. That training as well as others has served me well throughout my entire life. I attended local Community Colleges before I entered seminary. 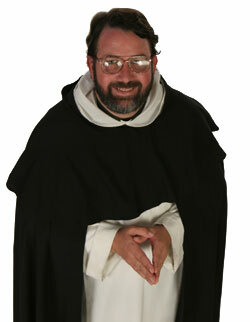 It was while attending Community College that I became a fan of some traveling ministries of the Dominican Order. One was a group called the Pilgrim Friars, a music group of Dominican Friars who were very talented playing Bluegrass and Salsa. I had never experienced such a wonderful means of sharing the Gospel message and preaching in indirect ways all the while entertaining the assembled. The other group was called the Priory Players. They were a theatrical group, preaching through plays -- just two or three of them going from parish to parish entertaining yet providing a powerful Christian message. They weren't only a traveling group. At Saint Albert's Priory, the home to these seminarians they would put on a play about once a year. I had seen three productions before I had entered. In part I think that creative way of preaching is what spoke to my heart and inspired me to be part of such a dynamic group of preachers. When I joined the Dominicans after much soul searching I continued my hand in theater by being part of the Priory Players and directing two major productions. But it wasn't all fun and games. Attention to studies at the Dominican School of Philosophy and Theology was of absolute importance. There I was immersed in biblical studies, and systematic theology, philosophies of man and history of the church as well as pastoral studies. One of my years of study was at the campus ministry at the University of Oregon. One of my summers was spent traveling as a pilgrim friar and experiencing hospitality and the diversity of the Catholic Church in the Western United States. One of my pastoral years was spent as a deacon serving Holy Rosary Parish in Antioch, California. This was my first experience of the complexities of parish and all that it takes to make a parish run, including finances. My ordination to the priesthood was by Bishop John Cummings of Oakland during my provinces' assembly. My first three years of priesthood were serving the community at St. Dominic's Parish in Benicia, California. The community was very formative in my priesthood. Helping me be compassionate and teaching me how to utilize my gifts. It was here that I learned how priesthood is so unique to the individual priest. God seemed to utilize my skills and history with theater and magic to help the youth group by putting one wonderful productions, haunted houses, dinner shows and floats for the various parades. It was there I began to fully develop the notion of using events as fundraisers for parish ministries. I will be forever grateful to the parish community of St. Dominic's and the way they have made me aware of my gifts. It is within the Dominican tradition that we be itinerant and we move frequently. My next assignment was in Tempe, Arizona serving as a Newman Chaplain to Arizona State University. I enjoyed four delightful years working with the student leadership helping them in their ministries. Like in Benicia, there were several opportunities to use my theatrical gifts in fundraising. It was there, working with the development director, I learned the value of having the community invest not just their money but that they needed to be aware of what the ministry is about. I particularly feel blessed in the ways we did retreat ministry. Providing meaningful retreats to college students was a great us of my gifts using creativity and organizational skill. I continue this aspect of my ministry as I worked at the Newman Center in Tucson serving the University of Arizona. Through out my priesthood I have enjoyed working with people, especially on special events like retreats and parish festivals. I believe it is because I really do see God working in everything. After five years in Tucson I went on a sabbatical year I called Magic, Meaning, and Mentors. It was a year of meeting with various religious and magic mentors who have inspired meet and have encouraged this unique form of preaching. It gave me the time to study with some of the greatest thinkers in magic performance and other opportunities too perform around the world in Rome, Venice, Paris, London and through out the United States. After my Sabbatical year I promptly went back to campus ministry, this time in Salt Lake City, UT. The time there was wonder-full and I continued to grow in working with young and old sharing my magic and developing new pieces in my show. From Salt Lake City I was assigned Pastor at St. Thomas More in Eugene, OR. Those five years were filled with new challenges and great opportunities working in the Northwest. The Northwestern United States has the greatest percentage of Non-religious which gave me a deeper understanding of the need for evangelization. St. Thomas More Newman center became a bright beacon for many who were lost in the cold because of the warmth of the student and permanent community. I am now assigned at Stanford continuing campus ministry which I love and working with very bright people. There is an energy on campus with a certain air of "possibility." That is what I think magic is all about. It reminds us that anything is possible and so my Job on campus is to remind people of the Gospel and that the possibility comes from God. I believe that people's eyes need to be opened to the wonders around them. That is why I enjoy doing magic. In performance magic people have that "moment of astonishment." In that moment, however quick, before reason over powers the experience, people are open to God in new ways. It is an honest moment and one which is hard to seize except through a theatrical experience. In such an experience people are willing, for an hour or two, to set aside convention and be taken to someplace they have never been and sometimes back to a place they have been before.